New Delhi: India and Russia are likely to ink a key deal for the joint development of a BRAHMOS 'mini missile' during the visit of Russian President Vladmir Putin later this week. Official sources said that a tripartite agreement in this regard is likely to be signed between DRDO, NPOM lab of Russia and BrahMos Aerospace. 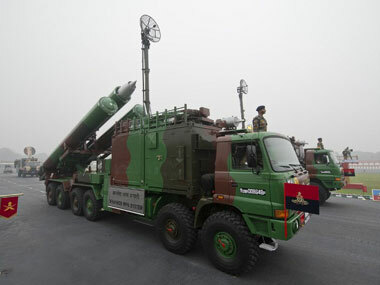 The new missile will have a speed of Mach 3.5 and can carry a payload of 300-kg up to a range of 290-km. In terms of size, it will be about half that of the present missile, which is around 10-metres long. The missile can be integrated with different platforms, including submarines and the Fifth-Generation Fighter Aircraft. Putin will land here on December 10 and fly out within 24 hours. BrahMos Aerospace, an Indian-Russian joint venture firm set up in 1998, feels that the new missile would be inducted into the services by 2017 and there would be a huge market in India, Russia and friendly foreign countries. The BRAHMOS missile can be launched through land, air, ships and submarines. While the Army and Navy have already started inducting land and sea-based BRAHMOS missile systems, the air launch variant is set for trials soon. India had last year successfully carried out the maiden test firing of the over 290 km-range submarine-launched version of BRAHMOS supersonic cruise missile in the Bay of Bengal, becoming the first country in the world to have this capability. The BRAHMOS missile is fully ready for fitment in submarines in vertical launch configuration, which will make the platform one of the most powerful in the world.